Our First BRONZE Ready For Pre Order Now! 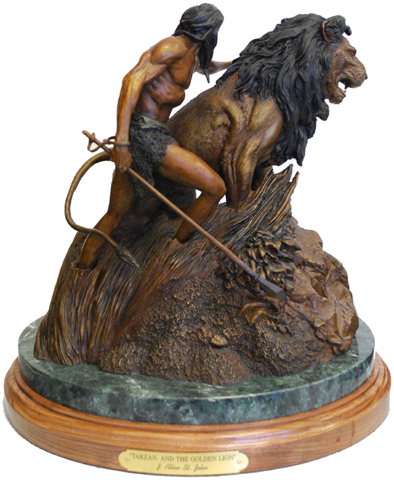 We have just completed our first bronze statue, Tarzan and the Golden Lion. This piece was originally sculpted for us and sold as a pre-painted statue. We are still selling the pre-painted edition, but we've always felt this piece warranted a true bronze edition. Shown is number 1 of 30 proposed units. We feel that it will become a highly sought after collectible in the years to come. As originally sculpted by Shawn Nagle the bronze was manufactured at our Texas foundry, Deep In the Heart. The units will not be in stores but will only be sold from the ReelArt Studios web site and the timeline for production runs from 12 to 16 weeks from point of order, generally around 12. They are hand numbered __ of 30 units of which you see the first featured here. Pricing is $3850.00 US plus shipping. A non-refundable deposit of $1925.00 is due at the time of order with the balance due at the time of shipping. Each piece is produced in the traditional lost wax method and hand-finished with painstaking attention to detail and include sophisticated patinas. The statue sits atop a rich polished marble base. Limited to only 30 pieces worldwide. Produced in the USA by Deep In the Heart foundry of Texas. When ordering our bronzes a non-refundable deposit of $1925.00 can be tendered to us by using Paypal or our Mail Order-FAX method. You'll find buttons to click on our Shop page which will generate the transaction. When the piece you order is ready, from 12 to 16 weeks after your order, you will receive an invoice for the balance due and the Shipping and Handling charge of $70.00, for a total of $1995.00, from ReelArt Studios president Michael Hudson via email. After the successful closing of this transaction your piece will be sent to you directly from our Texas foundry, Deep In the Heart. Please order by clicking here.